Activision's Call of Duty franchise occupies a fascinating place in the gaming landscape. It is the world's biggest-selling annual series, yet each year offers only incremental improvements. It is beloved by millions, yet derided by many as well. Its production values bring out the best in video games, while its online multiplayer community often brings out the worst. It is an enigma. And in the eight years since the first game in the series was released, in many ways it's come a long way. And in other ways, it hasn't gone very far at all. The gallery above will take you on a tour of the history of the series, showing footage from all the major entries in the franchise, and some less than major entries in the series. What's interesting to note is that while the graphics have improved and the multiplayer has taken precedence over the singleplayer, the core tenets of the game remain the same: you take control of a few soldiers in a battle, there's a ton of scripting, there's cinematic bombast and then, when you want to play against real humans, you pick up a gun and run around like madmen shooting anything that moves. Call of Duty (2003) - The original. First released on PC, it laid down a template that's still being used by the series' developers to this day. Call of Duty: United Offensive (2004) - An expansion pack for the first game, providing more missions set in Europe. Call of Duty 2 (2005) - Probably my favourite entry in the franchise. Stuck to the same formula but kicked everything up a notch. The Market Garden missions are all-time classics. Call of Duty: Big Red One (2005) - A console game based on the events of the PC's Call of Duty 2. Call of Duty 3 (2006) - The first annualised entry in the series, and the first main game to be developed by someone other than franchise founders Infinity Ward (though Treyarch had done Big Red One, released a year earlier). Wasn't as well-received as the first two games in the series. Call of Duty 4: Modern Warfare (2007) - A total reboot of the franchise, taking it away from its Second World War roots and thrusting it into a contemporary scenario lifted straight from a Tom Clancy novel. A blockbuster success, and for many people the best game in the series. Call of Duty: World at War (2008) - Treyarch take the franchise back to the Second World War for the last time. 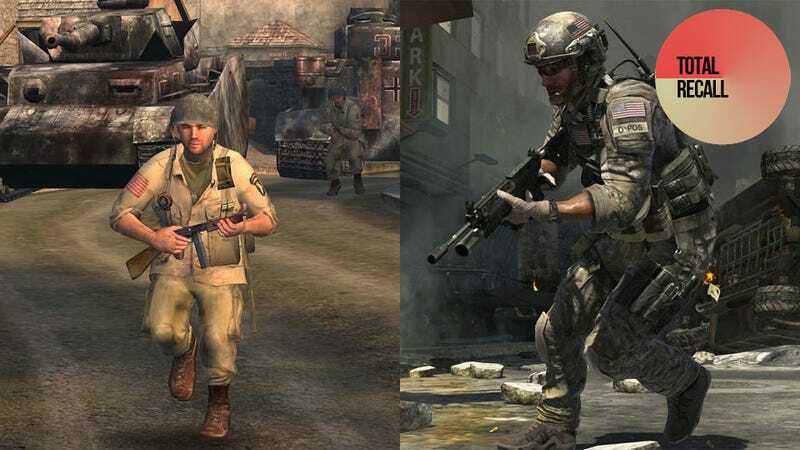 Call of Duty: Modern Warfare 2 (2009) - Infinity Ward's Modern Warfare sequel falls flat as a singleplayer experience, but continues to refine its multiplayer. Call of Duty: Black Ops (2010) - Treyarch finally leave World War Two behind and stake out their own turf in the franchise's canon, focusing the story on the Cold War.